The good news is that the European Union has ramped up its sanctions against Iran and Syria. The bad news is Europe’s ongoing recalcitrant indulgence toward Hezbollah, the proxy that obligingly serves masters in both Tehran and Damascus. This is akin to tightening the siege but leaving the enemy a gaping dodge-hole. The EU’s crackdown is significant as it freezes the assets of more than 30 Iranian firms and institutions, among them the National Iranian Oil Company and the National Iranian Tanker Company, both crucial to earning the ayatollah regime foreign currency. This is sure to render Iran even more cash-strapped than thus far and acutely restrict its ability to do even subterranean business with the West. Also banned are transactions with NIOC subsidiaries, the National Iranian Gas Company, National Iranian Oil Refining and Distribution and various banks. The broader aim is to also prevent cooperation by European interests with Iranian maritime concerns and obstruct Iranian oil exports to customers outside the EU. Concurrently, the EU has imposed a freeze on assets and travel bans on 28 additional Syrian higher-ups and two commercial firms. This raises the number of Syrians blacklisted by EU countries to 181 and the number of companies to 54. Just as all this was happening, the US had at long belated last admitted that Hezbollah continuously escalates its pro-Assad intervention in the Syrian civil war and has in fact become no less than a component “of President Bashar Assad’s killing machine.” Speaking at the UN Security Council’s monthly meeting on the Mideast, US Ambassador Susan Rice added that Hezbollah leaders, in cahoots with Iran, also keep conjuring up new stratagems to keep Assad in power. There can be no more smug obfuscation of the picture – Hezbollah is not just a major force in Lebanon but a potent ideological/religious mercenary whose fighters, among other assignments, play a key role in perpetuating Assad’s grip on power and raining terror on Syria’s populace. Yet back in EU headquarters, Hezbollah is confoundingly still regarded as a social movement, part of Lebanon’s legitimate civic and political structure, rather than the Iranian-backed terrorism-exporter that it is. Europe inexplicably remains impervious to Hezbollah’s exceptionally bloody record and ongoing war crimes. The emerging situation is one in which Europe is ostensibly seen to be doing the right thing vis-à-vis both rogue Mideastern regimes – Iran and Syria – while simultaneously turning a blind eye to the actions of their enabler, Hezbollah. At the very least this would appear to contradict and undermine the good intentions. It gets even stranger. 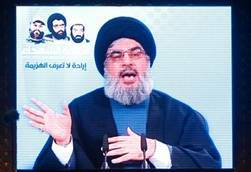 While official Europe strains itself to hinder trade with Iran and to punish given upper-echelon Syrians, it allows Hezbollah to raise funds quite boldly within the EU itself. Hezbollah boasts many adherents among Europe’s burgeoning Muslim communities, most notably in Germany. Hezbollah emissaries visit their European adjuncts (and often also sleeper cells) and openly solicit contributions there. The cover story – in keeping with the EU’s formal perception of the organization – is that the money is earmarked for social-welfare and educational projects in Lebanon. However, intelligence organizations worldwide agree that funds from Europe help to plug shortfalls and to bankroll terrorist operations. The mounting and very tangible evidence of critical Hezbollah complicity in the mass murder of Syrian civilians has not dented the EU’s disinclination to include the group on its list of terrorist organizations. Israel has frequently urged the EU to label Hezbollah as terrorist, yet these entreaties fall on deaf ears. Europe appears insistent on seeing only Hezbollah’s charitable front, though such fraudulent facades are part and parcel of the modus operandi of most terrorist outfits, a fact that should not surprise or have escaped the attention of Europe’s movers and shakers. The paradox is that while Europe clamps down on financial and commercial transactions with Iran and selected Assad sidekicks, it allows Hezbollah to do business that circumvents EU sanctions. By no means is this an inconsistency that exclusively affects Israel. Europe permits a dormant terrorist potential to thrive in its midst, and it knows so, its denials notwithstanding. What else is new in Europe? Following it’s love affair with Martin Luther and Hitlerite movements, it’s rapidly, and seemingly happily, coming under the thrall of Islam. As John Wayne would have said, to these arrogant, smug Europeans, “Get down off your high horse, mister!” Its hard to know what the endgame of the EU really is; based on their mixed-message behavior towards Iran, syria, and Hezbollah. What’s the use of clamping down on Syria and Iran, if you’re going to give Hezbollah a free pass? Instead of making life hard for these thugs, Germany coddles them. Go figure. Don’t look at the EU’s inaction towards Hezbollah as a paradox but as their policy. Look at how they get so hot and flustered when Jews are building anything,especially homes anywhere in their ancient homeland of Israel and speak out loud and clear. Their silence and pathetic excuses on Iran’s proxy Islamic terrorist army Hezbollah is unforgivable. They go into fits when homes are being built in Jerusalem but have grown comfortable and accepting of Hamas,their missiles on Israel’s cities and their agenda of exterminating Israel. This should tell every Israeli something horribly real ,which is, the final solution process continues now under a more stealthy gambit. The deeds of the EU prove beyond any doubt that they have put their lot in with the enemies of Israel. The rest of their mega scam, the Iran sanctions,the binders of lies,etc.are nothing but window dressing to throw off their crafty,devious anti-Israel agenda. Of course Germany is on the forefront of this dirty game…we all remember Hitler and his beloved Grand Mufti ! Why would a democratic union (i.e. the EU) so obsessively undertake to derail fellow-democracy (Israel)? 2. But the EU is not really a democratic union to start with. It is simply communism, or rigid central statist autocracy, in slow motion. America’s enemies. Beijing officials are not struck by the prestige of Xiaobo’s new distinction. I did not know that Martti was the former President of Finland.